2014 has started off with a bang! On the morning of January 1st, as Engineer and I were finishing up party prep for our annual New Year's Day Come & Go, Diva came barreling through the house, stopped short in front of us, and with tears in her eyes shouted, "THEY GOT THE CALL!!!!" Diva and Abby, Anthony's sister, text back and forth regularly and before I was notified by their parents, Abby had already told Diva that they had received the call. What call you ask? THE call. The one from the transplant team telling them that a heart had become available. Our little trio stopped what we were doing and began giving praise to God and praying for Anthony, the Herman family, the doctors, safe travel, the donor's family, a perfect match, a speedy recovery, for anything and everything we could possibly think of pertaining to the transplant then we carried on our day - but not as we usually do. All day we waited in great anticipation - like expectant family members waiting for the birth of a loved one - for news of a new life. At the party, conversations continually came around to, "What's the latest?" and when an update did come in, it was shouted from the rooftop...or at least, from room to room and out the back door. An impromptu prayer service was organized by our Associate Pastor and at 7pm, just as the service began, I received the text that said they were wheeling Anthony into surgery at that very moment. As it turns out, the brother-in-law of one of our friends was on the organ harvesting team for Anthony's case. The Hermans were in constant contact with Highway Patrol all the way so that they would have clear passage to Dallas. The same surgeon who assisted on Anthony's first surgery at 9 days old was the surgeon for this, hopefully his last, surgery. 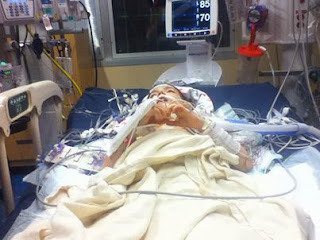 A 14 year old from Marshall is in Children's Medical Center with complications from the H1N1 strain of the flu. The Hermans were able to visit and pray with her family. Another child with ties to Marshall was at Children's getting placed on the transplant list while Anthony was in surgery coming off of that list. The Hermans were also able to talk and pray with that family. The donor heart was a perfect match down to the size of the blood veins! Anthony's 11th birthday was on New Year's Eve and on New Year's Day, the Donate Life float won an award in the Rose Parade - incidentally, it was their 11th year to participate in the parade. From the waiting room of the cardiac ICU, the Herman family could see Reunion Tower that was lit with a heart instead of its usual glowing orb. I choose to believe that was another little wink from God. The operation went extremely smoothly and Anthony is doing well. The Herman family covets your prayers as do the families of those other two children that I mentioned. 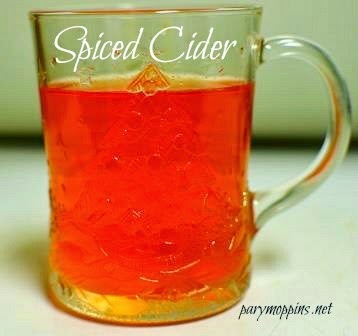 As the title of this post suggests, I've got a non-recipe for spiced cider. Why did I think it was appropriate to post this recipe along with an update on our dear friends' son? Maybe because it is red like a heart. But probably because it is served every single year at our New Year's party which forevermore I will consider Anthony's re-birthday party; therefore, this will be our toast to heart transplant recipients everywhere. I make this is a 30 cup percolator so my quantities are large. Pour the apple juice in the percolator. Pour the red hots into the percolator's basket. Put the lid on the percolator and turn it on about an hour before your guests arrive. If you want to make a smaller quantity, put about a teaspoonful of red hots in the bottom of a mug and fill it with apple juice. Microwave it until hot and red hots are melted. This is such a great story! 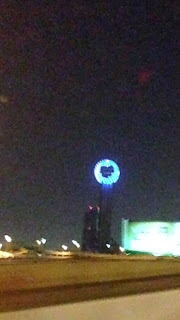 I love that the Reunion Tower was lit up like a heart. Such a great coincidence. God is great! This is such a great story....some things were just meant to be! What a heart warming story and journey to be a part of. Thank you so much for sharing this precious post with us. Thanks Miz Helen for dropping by!